Lithuanian composer and conductor Mindaugas Piečaitis discovers the YouTube videos of me playing the piano and becomes inspired to write a concerto based on my playing. He then contacts my personal assistants, Burnell & Betsy, and the rest is history. CATcerto is born and performed in Lithuania, the UK and the USA. The piece is performed by live chamber orchestra with me appearing as guest soloist via pre-recorded video projected onto a large screen behind the other musicians. 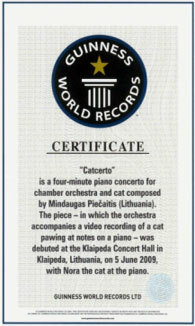 Next, the folks over at the Guinness World Records office get wind of it and decide to grant the award to Piečaitis for the world’s first ever concerto written for a cat. Look for it in GWR book for 2012, published in September of 2011. How cool it that?